France stays Catholic and recognize the Pope's power over councils. Done by Francis 1. Ruled as regent for her sons, she was unsuccessful as a politique due to massacring the Huguenots in the St. Bartholemew's Day Masacre. Catherine de Medici ordered the Huguenot's who were gathered in Paris for Henry of Navarre's wedding to be slaughtered. The Pope laughed and gave the messenger a bag of gold. "Paris is well worth a mass". He converted from being a Huguenot to Catholicism to be king. He issued the Edict of Nantes, allowing Huguenots to practice their religion (in Huguenot Pockets). A politique because he had religious tolerance for Huguenots. He was killed by a religious zealot. Richelieu sends troops to lessen the power of the Hapsburgs. "By the time this is over, France is the strongest country in Europe." Richelieu had all of the power. The French Academy put out the first French dictionary that helped to standardize the French language. He took away nobles castles. He destroyed the walls surrounding the Hugeunot cities.He sent troops into the 30 Years War to defeat the Hapsburgs. "I am the state." He spent a ton of money on Versailles. He revoked the Edict of Nantes which angered the Huguenots who left and France lost a huge tax base. He completely controlled the nobles, made them live in Versailles and want to do things for him. King Carlos II of Spain wills the throne to France (Philip of Anjou). Treaty of Utrecht says that Spain and France can never unite. France lost. Mistress was Madame Pompadour. Roccoco was the art style in his rule. Believed government should have separate branches with checks and balances. Government was effected by climate. Austria vs. Prussia on continent. Off the continent, Austria's allies (France and Russia) vs. Prussia's allies (Britain) who won. "I may not agree with what you say, but I will defend to the death your right to say it." About free speech, totally for it! "Crush the thing"- Hated the Catholic Church. Children should learn from experience, against the Enlightenment because he wants people to act on impulse and emotion rather than logic and reason. Government should be ruled by the general will of the people. No major changes on the European continent, off the continent, Britain got all of France's colonies. He was a push over married to Marie Antoinette. The french hayed her because she spent so much money and lived in luxury while the people had very little. He was beheaded for treason. The French helped to get revenge on Britain. Their involvement destroyed the French economy. Abbé Sieges advocated for more power for the third estate. Signats was paper currency backed by church lands. Civil constitution of the clergy put the clergy under the control of the government. Constitution of 1791 made France a constitutional monarchy. National convention was led by Robespierre and the committee of public safety which was the cause of the reign of Terror. The reign of terror executed many members of the third estate as conspirators against the revolution. Thermadorian reaction had Robespierre executed for acts against the revolution. Concordat of 1801 made it possible to openly practice Catholicism France is mostly Catholic. The Napoleonic code was enlightened because it made all land owning men equal. The contiental system was economic warfare against Britain. His empire consisted of France proper, annexed states, and allied states. When he invaded Russia his troops were decimated by the Russian winter. Napoleon invaded Spain and the Spanish attacked the FrenchTroops using guerilla warfare tactics. France didn't fare so well. 3 goals: return legitimate rulers to the throne, balance if power, war reparations. France was represented by Talleyrand and was not given much power at first but then became a key player in the COV. Napoleon returns to France from exile in St. Helena and takes over, welcomed by the French people. Battle of Waterloo, Napoleon was defeated and exiled to Elba. Conservative, the July Ordinances: dissolved the Chamber of Deputies, decreased the number of voters, and censored and controlled the press. The people rebelled against these measures. Against Charles X, the French people revolted and formed barricades in the streets of Paris. He was called the citizen king. Called the Orleans Monarchy. He supposedly dressed like the people. He ignored the demands of the urban workers and caused the Rebellions of 1848. They had a Republic with a unicameral legislature, all males had the right to vote, the president was Louis Napoleon Bonaparte. Influenced by the economic philosophy of socialism. Rebellion against King Louis Philipe and Prime Minister Guizot, a Provisional Coalition took over. (March-May) Louis Blanc was a Utopian socialist who wanted national workshops (government provides full employment). They didn't work out; not enough jobs or money, government basically handed out checks. He invented the printing press. Believed in Salvation through Faith, and the Priesthood of all believers (everyone equal in the eyes of God), all you need was the Bible, not the Church, he did not believe in revolting against the government. He was known as the Universal Monarch. He inherited Spain from his mother and everything else from his father. When he retired to a monastery, he split his lands, Spain to his son Philip II, and HRE to his brother Ferdinand. Holy Roman Emperor Charles V Luther to recant his 95 Thesis. Luther refused and was forced to flee. They used his idea that everyone was equal in the eyes of God, to say that they should be equal politically as well. Luther responded with writing the Angry and Thieving Horde, saying he disagreed with the revolt and that the peasants should be loyal to Charles V.
Worked to make the Church less corrupt. It was pretty successful. Allowed princes to pick the religion for their region (Lutheranism or Catholicism), Cuius regio, ehius religio. His realm, his religion. Protestants vs. Catholics, then everyone vs. Hapsburgs. Started with the Defenestration of Prague, France wanted to curb the power of the Hapsburgs. Off the continent, Austria’s allies (France and Russia) vs. Prussia’s allies (Britain) who won. His mother was Maria Theresa, he was tolerant of other religions (yes, even Jews), he freed the serfs. During the Enlightenment, Vienna was the center for music. The Metternich System squashed any revolts, and many liberties of the people. The Carlsbad Decrees censored the press and liberal ideas especially in the universities. He hated nationalism and liberalsim. 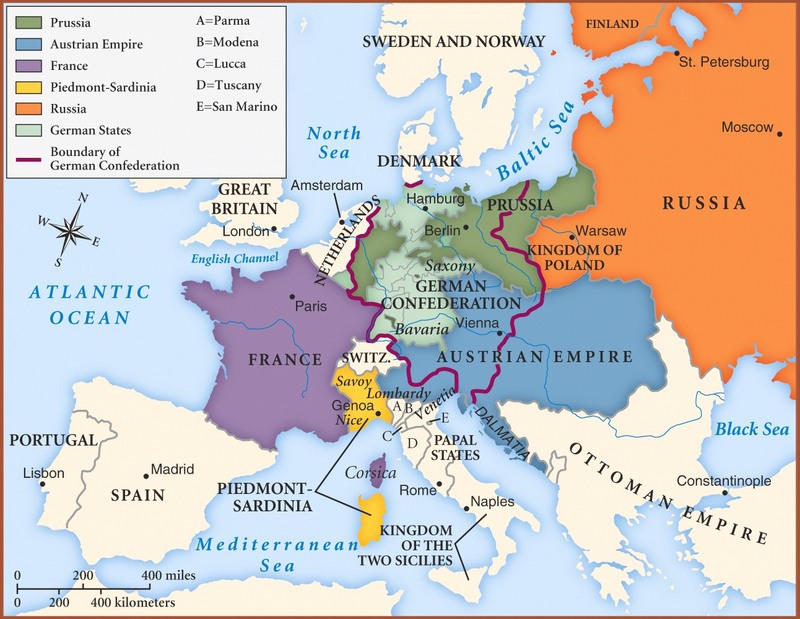 The people wanted a unified Germany, Franz Joseph reasserted the Ancient Regime and Hapsburg dominance after Metternich and the king flee to England. He was the soldier king because he made Prussia a military power, loved tall soldiers. His reforms included education and construction of roads. He broke the Pragmatic Sanction and invaded Maria Theresa in Austria to gain Silesia. Austria vs. Prussia, Austria won and ceded Silesia to Prussia. He was a preacher and author who encouraged nationalism and patriototism,he supported the French Revolution. He was an early Romantic (storm and stress "strum and drang"
History progresses by starting with a Thesis, synthesis then occurs and an antithesis forms. when the antithesis becomes the accepted thesis, the cycle starts again. 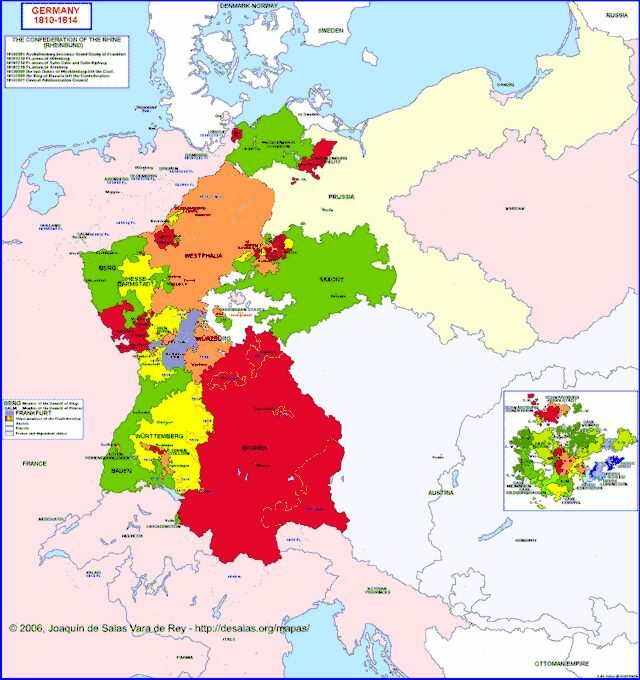 Wanted an elected Parliament and to unify the states as a German Empire. They offered the crown to Frederick William II who rejected it as a "crown from the gutter" because it was offered to him by elected representatives rather than princes. The Early Renaissance begins in Florence and moves to Rome for the high point. Emphasized human talents/ celebrated humanity/ emphasized the arts. It was organized into city states. The Medicis ruled and had power power because they were wealthy bankers. The invasion of Charles V and the HRE ended the Renaissance. This book described the ideal Renaissance man. Chivalry, religious, into the arts. Monarchs should not be afraid to make unpopular decisions, they should not be afraid to make the people fear them (New Monarchs) enforce their rule. He proved that the sun was the center of the universe (proved Copernicus right) it was a theory not a fact. He was forced to recant. These revolutions were never successful because the three groups were competing and never worked together to throw out Austria and the Bourbons. He led a revolution in 1848, his group was the Young Italy and they wanted democracy.